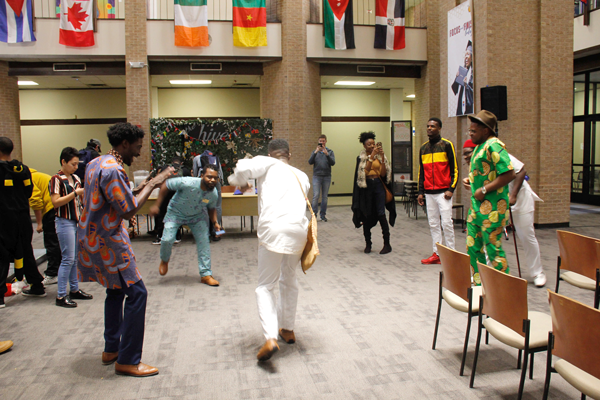 Students danced to foreign music, snacked on foods from across the world and discussed their heritage and favorite culture Nov. 15 during Eastfield’s International Celebration. The event took place during International Week. The week included information about the benefits of studying abroad and international cultural exchange, celebrated the traditions and customs of other nations and offered performances and an art exhibit to demonstrate the way society is shaped by worldview and heritage. “It’s very important when talking about global citizenship and culture,” Student Programs Development Coordinator Danae Bass said. That’s one of the reasons Mountain View College Spanish professor Ulises Rodriguez-Figueroa is planning a trip to Cuba with a group of Eastfield students. The trip, a part of international studies offered by the Dallas County Community College District, will give students credit and non-credit options to go to Cuba and learn Spanish through immersion. Equally important as the language learning, Figueroa said students will broaden their worldview and open their minds on the trip. Jide “JC” Carew, an Office of Student Engagement and Retention event coordinator, encouraged students to embrace that exploration of culture at the International Celebration. He walked around the Hive asking students what heritage they claimed and what cultures interested them. Korean, Japanese and Latin cultures were of particular interest to students. Eastfield hosts 71 international students from 20 different nations, according to the International Student Admissions office. Carew brought a piece of his culture through his euro and buba, a shirt and pants traditionally worn in Nigeria.